Evans Keane LLP Hosts Food Drive for Idaho Foodbank's "Hope for the Holidays"
Every year the Idaho Foodbank reaches out to the community to provide meals for those in need. 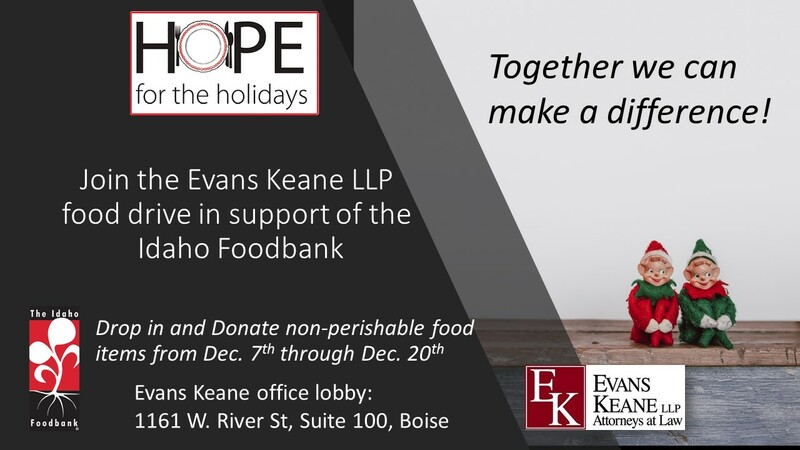 This year, Evans Keane LLP will host an on-location food drive in support of the Idaho Foodbank’s Hope for the Holidays food drive campaign. The Idaho Foodbank’s goal is to provide “Hope for the Holidays” to thousands of Idahoans who are struggling to put food on the table by distributing the food for 2.7 million meals now through December. To make this goal a reality we need your help. Please join Evans Keane LLP in sharing our good fortune with those in need in our community by bringing non-perishable food items by our office Monday through Friday, 8:30 am to 5:00 pm. If you are unable to bring something by the office, please consider contributing to our on-line drive, accessed with the link below (to a designated Idaho Foodbank website donation page).